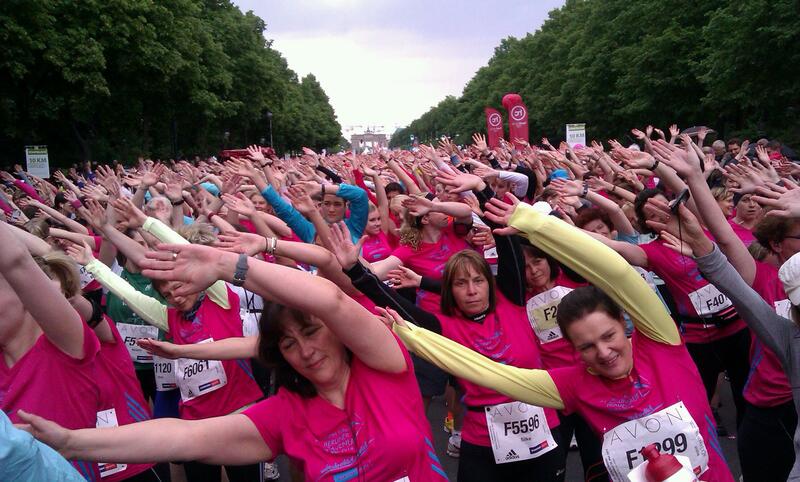 On Saturday 10th May the 31st Avon Womens Running event took place, closing the main avenue that leads up to the Brandenburg Gate, and filling it with a sea of pink. The event lasted pretty much the whole day, starting off with a 5km walk, Nordic walk and run. The 10km event came later, kicking off at 6pm. It is a massive event. With an entry limit of 18,000, it shouldn’t have been a surprise to see so many there. 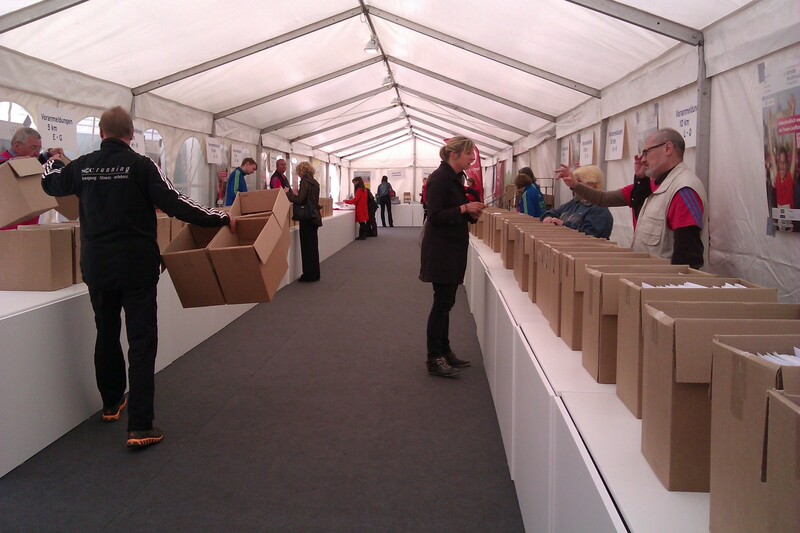 Race kit collection was an efficient operation at Karstadt Sport in Joachimstaler Str. Each entrant received a pink Addidas t-shirt, race number and timing chip. The pre-race warm up by Hard Candy Fitness had the crowds swinging their hips in a Salsa style, followed by a more traditional runners-specific routine with some great motivational beats. The course certainly wasn’t record breaking. Weaving through Berlin’s main city park, Tiergarten, it was soon evident the pathways were not wide enough for the amount of runners. Those trying to get through the masses had to weave around the slower runners, avoiding trees, bins and signposts. Upcoming water stations had to be negotiated tactically. I personally don’t need fluid on a 10k, so once I’d worked out where the 2 stations were, I decided to go wide of the tables and managed to avoid a fatal trip over a cup or fellow runner! 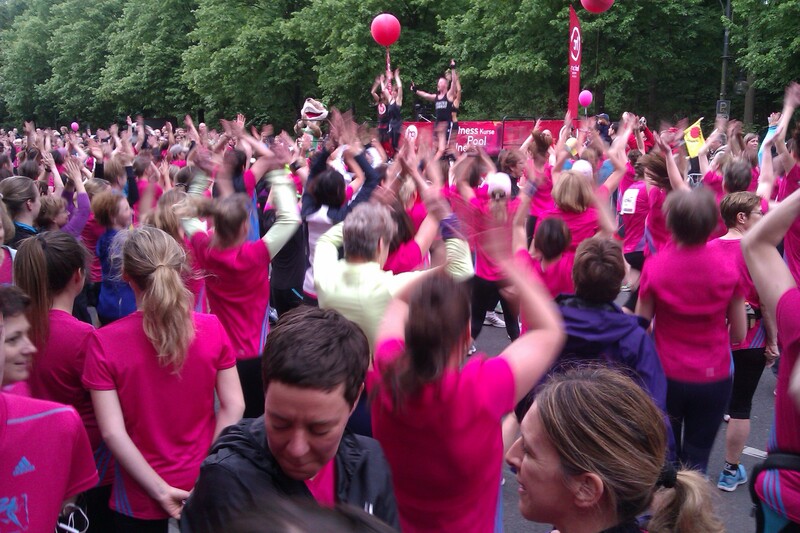 The course sent us back down Strasse des 17 Juni, where the big crowds cheered us on. It’s so great to hear the roar of the supporters, whatever distance you run. Our race numbers had our first names printed on the front, so if you were really lucky, someone would call your name too. This doubles the motivation as far as I am concerned! Heading past the Brandenburg Gate for the last time, the finish line came into sight. 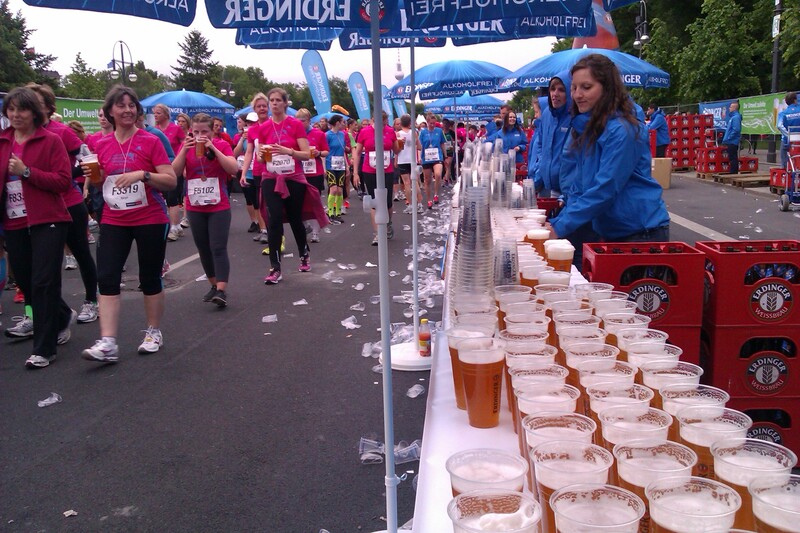 A medal for each runner, then tables of water, followed by herbal tea, and then, of course, the Erdinger (alcohol free) Beer stands. This is a sight that never fails to impress me. This is Germany after all. I finished in 52:14. Not my fastest time, but I’m pretty happy to have survived without a fatal stumble.